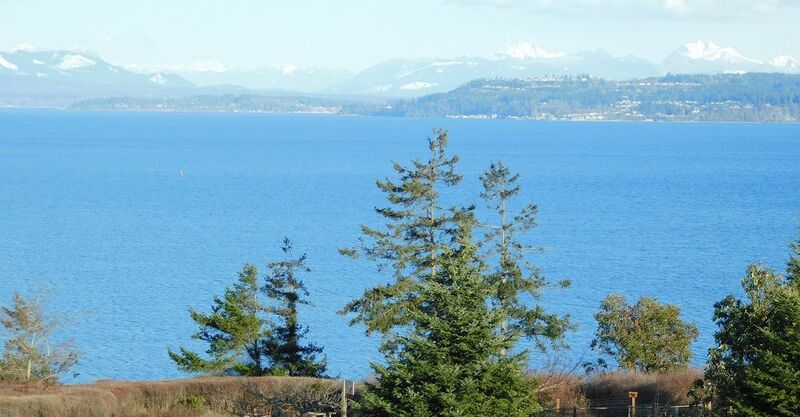 This lovely home is on a 3/4-acre property overlooking beautiful Oak Harbor Bay and Saratoga Passage. The property provides you with a beautiful view of Mount Baker and the Cascade Range. This home has a modern design featuring an open floor plan with sliding glass doors to fresh sea air and access to yard and patio. You will enjoy the lower floor of a two story home with private entrance to your suite (nearly 1,000 square feet). You will find it very quiet as no children or pets live here. Also, the suite is located on a residential street with no outlet. The well-appointed kitchen has all you will need to create memorable meals during your stay. Sleeping accommodation is a Sealy queen-sized pillow-top mattress. You will enjoy the luxurious 600 thread count linens. Your entertainment unit houses a large TV, DVD player, reading library, current magazines and sound system. Have dinner in your suite or on the patio where you will enjoy the watching the sailboats pass by. This home is perfect for two adults. Keywords: Mountain/Ocean View, Romantic, New, Immaculate! We are natives of Whidbey Island. We live quietly on the upper level . We here if you need us and invisible if you do not! Places to sit to enjoy the wonderful view! Karen and Sean are amazing host! Quick to help and answer any questions you may have and will check on you on occasion to see how you are doing without being overbearing. The space you have, starting with parking. You can easily fit four vehicles in the driveway that is given to you for the rental. The yard is big! I have three daughters and they would play outside all day. Karen owns the book store on Pioneer and can give you some great recommendations for books if you're big on reading and, even if you're not the rental has a lot of books inside that are all great reads. The view is breathtaking and will hit you with a huge sense of calm. My daughters loved the wild life that you'll see here. Ranging from deer, rabbits, Bald eagles, seagulls, and a mix of others and with the set of binoculars that are a part of the rental you will see more. Sean will let you know of events going on around town or great places to take the family for sight seeing, picnics, or just walks. The rental and owners are amazing, I would recommend this place and by extension Karen and Sean to everyone. Thanks for a great review! It was fun hosting you guys! Wonderful property! Quiet, serene and beautiful! Very comfortable and has everything we could need. Wonderful! we are so glad to hear that! The view from the property is beautiful and the studio is well equipped, but the bed was incredibly uncomfortable. We left a week ago and are still in pain from the mattress. We were really cold as well because the studio does not have its own heating. Thankfully Karen brought us a space heater that worked well. The major drawback from this trip was Karen's unwillingness to communicate with us. The power in the basement went out on us late one night and we couldn't figure it out... we finally decided to call her and she answered, but when we tried to call back because we were still sitting there in the dark, she had her phone turned off. I tried to call her prior to the trip to ask about having a package mailed and she would not answer or return my calls. I called after we left with a question and left a message and she would not return the call either. All in all the trip was not awful but there were definitely problems. I hope in the future Karen is willing to cater to her guests a little better because that lack of communication really put a damper on our honeymoon. Thanks for taking the time to write a review. Yes, everyone loves the scenery! In response to your comments we have added a memory foam mattress topper. We also have an additional new heater in the bathroom. As to your comments on communication, I am either at my home (seconds away), or at my store (phone number displayed in unit), or by email through the VRBO site. Also, as you know, any "extras" (blender,crab cooking utensils) are quickly made available. Thanks for staying with us! I stayed for 7 days it is a very nice quiet place has a very nice view of the ocean not too far town close to everything you possibly think of Karen is very friendly and I would love to return. it even had enough room to have my 2 kids and there family's over for dinner. Thanks! We are glad you had a great visit! Cozy apt with excellent view! Nice quiet neighborhood provided a relaxing weekend for us. Thanks! We always appreciate your reviews! Check-in time at 4pm, check-out at 11am. If you are currently staying at the rental and cancel, there is a $150 current cancellation fee. One week minimum.